METTLER TOLEDO presented its new high-end line of touchscreen scales called FreshWay at EuroCIS 2016 in Dusseldorf. FreshWay combines award-winning design with optimum performance. Whereas the FreshWay T housing is similar to that of a classic counter scale, FreshWay V is METTLER TOLEDO’s first-ever touchscreen scale based on a modular concept. Thanks to standard interfaces and open PC-based technology, the FreshWay series of scales offers grocery retailers countless opportunities for close integration of the scales into operational processes and ERP systems. 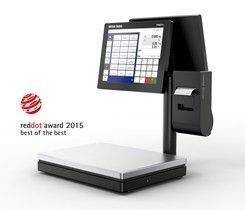 Grocery retailers who choose the FreshWay T touchscreen scale are assured of high-performance and future-proof, state-of-the-art weighing technology. FreshWay T represents an impressive range of custom-designed weighing solutions for a multitude of retail environments – whether at supermarket service counters, in backrooms or embedded in a POS solution at hot food outlets or in deli stores. The scale has impressively clean lines creating a pure and simple shape and a slender silhouette that avoids obstructing the line of sight to shoppers and hence contributes to a sense of openness in stores. With its contemporary yet timeless design which has been recognized by a ‘Red Dot: Best of the Best’ award, METTLER TOLEDO is setting a new standard in terms of creating the perfect sales image. A perfect fit: thanks to its modular concept, the FreshWay V touchscreen scale gives food retailers more freedom to tailor the design of their counters and optimize customer service. The touchscreen operator display, customer display, printer unit and weighing plate of FreshWay V are each individual modules that can be placed anywhere. This makes it extremely easy for grocery retailers to align the weighing and POS activities with the space and circumstances at each specific counter and to optimize employee access to the fresh product display. FreshWay V has a flat, modular weighing plate that does not cause any obstructions in the counter work surface. Ergonomics: Employees can freely adjust the tilt angle of the FreshWay scale’s touchscreen operator display to their own requirements. This makes it easier for them to weigh and serve customers faster, more ergonomically and more accurately. The high-speed, 2-inch receipt printer includes automatic paper-cut function. Thanks to the drop-in mechanism that is accessible from above and opens at the front, employees can change the paper roll in a matter of seconds – which is especially important to prevent hold-ups in serving shoppers at peak times. Hygiene: FreshWay has no gaps or edges that could harbor grime. The weighing plate can be removed quickly and is easy to clean. Thanks to the non-stick surface, stray labels can be easily removed. All FreshWay scales are fanless and dispel heat via the housing, thus saving energy. This also avoids undesirable air turbulence in the vicinity of the fresh product display and eliminates ventilation slots which can attract dirt and pose a hygiene risk. The support feet on the weighing plate are protected against accidental adjustment, such as during workspace cleaning, ensuring that FreshWay always remains in perfect balance and delivers weighing precision every time. In-store marketing: All models in METTLER TOLEDO’s new FreshWay family of scales have a fast processor, large RAM and SSD memory technology, giving them sufficient computational reserves for graphics- and data-intensive digital signage campaigns at the point-of-sale. Each with a 12.1-inch high-resolution customer display, METTLER TOLEDO FreshWay T and METTLER TOLEDO FreshWay V provide grocery retailers with the perfect multimedia platform for sales-boosting special offers and eye-catching branding POS campaigns in their fresh departments. The horizontally adjustable customer displays with LED backlight technol-ogy provide impressively high viewing-angle stability as well as excellent brightness and contrast values for optimum legibility. Compatibility & Connectivity: FreshWay enables food retailers to gradually migrate to the new family of scales. For example, FreshWay can be used in mixed environments together with METTLER TOLEDO UC Line and UC Evo Line touchscreen scales with UC3 software v.1.29.1 and upward. All cable connections are located on the underside of the scale, and the cables are protected against accidental removal. The integrated WLAN anten-na enables the scale to be optionally connected to the net-work without LAN cabling, which is ideal when setting up a network connection from a temporary sales area for example.